Disable ‘Change Password’ – Change password option can now be ‘hidden’ with the use of a new Spider Configuration key of “ENABLE_CHANGEPASSWORD”. This option can be used by schools who have alternate methods for changing user passwords, such as through a Single Sign On Interface. Set the key to FALSE to disable / hide the ‘Change Password’ option at the top of the Spider screen. View Student Info from Absence Entry – Absence Entry control has now been enhanced to enable teachers to view the Student Information control for students in their class by simply clicking on their name in the roll. This option can be enabled with the use of a new Spider Configuration key of “SHOW_STUDENTINFO_FROM_ABSENCEENTRY”. Set the key to TRUE to activate this option. 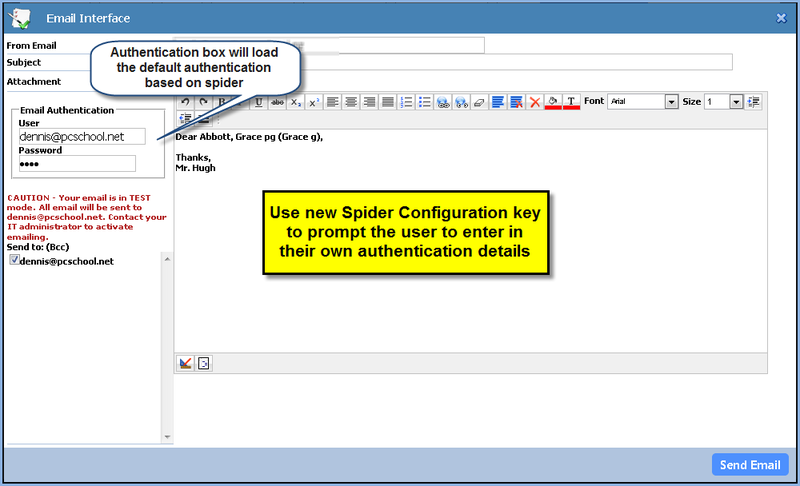 Enable Email Authentication – Email Authentication can be set to use the default setting in Spider Configuration file when sending out bulk emails from Spider (such as Parent Teacher Interviews) but the addition of a new configuration key will prompt individual teachers to enter in their personal email authentication details when sending out emails emails to students / caregivers from within Spider. This option can be enabled with the use of a new Spider Configuration key of “LOAD_DEFAULT_EMAIL_AUTHENTICATION”, a value of FALSE will require teacher enter authentication. This entry was posted in Configuration, Spider and tagged change password, Classroom Management, email authentication, pcschool, school administration software, School Administration System, School Management Software, School Management System, school software, spider configuration, spider email authentication, Student Information System, student management Software, Student Management System, web config file, web spider by studentmanagementsoftware. Bookmark the permalink.